We depend on our lymph nodes to maintain the proper functioning of our body, particularly our immune system. Any trauma or infection can cause swollen lymph nodes under chin. These nodes under the chin and jaw are just as vital as any other ones we have. Know what’s behind the swollen lymph nodes under jaw causes and how to treat them with natural home remedies. What Causes Swollen Lymph Nodes Under Chin? Infection or inflammation of the lymph nodes under chin can cause problems, as the nodes filter harmful bacteria from our systems. We will now look at all of the swollen lymph nodes under chin causes. Any infection of a lymph node may cause swelling, such as infected wounds, strep throat, measles, mumps, infectious mononucleosis, ear infections, chickenpox, certain skin conditions, tonsillitis, and laryngitis. Issues with your teeth and mouth including sores, an abscessed tooth, or even periodontal disease can cause swollen lymph nodes. Less common infections may result from animal bites, consuming undercooked food, and toxoplasmosis. The lymph nodes under the chin and jaw can become swollen along with the thyroid gland. It may be the result of problems with the thyroid, such as the development of a goiter due to an iodine deficiency. As your lymph nodes are a major component of immune system function, any issue with the immune system will affect the lymph nodes, including the ones under the jaw and chin. Immune system issues include leukemia, lymphoma, rheumatoid arthritis, lupus of the lungs, and the human immunodeficiency virus (HIV). We take medication to address health concerns. However, some medications can cause unrelated problems such as swollen lymph nodes. Take note of any swelling with the use of prescriptions for seizures and immunizations for typhoid or malaria. Swollen lymph nodes under chin can occur due to several other factors and health conditions. These may include cysts, mouth tumors, and diseases of the head and neck. Treatment for the swelling of lymph nodes under chin and jaw depends on the underlying cause. They may not need treatment as they may disappear as quickly as they appeared. If you seek medical treatment, the physician may be able to feel the swelling with a physical examination. Further testing to determine the severity of the swelling and possible cause can include blood tests, a liver function test, and a kidney function test. Also, a biopsy of the swollen lymph node may be necessary. Medical treatments may include antibiotics, surgery, chemotherapy, and radiation therapy. However, there are home remedies for swollen lymph nodes under chin to alleviate any pain and help reduce the swelling. Soak a cloth in hot water and place it on the swollen lymph nodes for five to 10 minutes. The warmth will improve blood circulation and reduce the pain and the swelling. Repeat several times each day. Toxins create inflammation and pain. You can relieve the swelling with a gentle massage of the affected area, which can disperse the pain by stimulating the lymph nodes to work properly. Massage for five minutes two or three times each day. Use a saltwater solution to target the inflammation that causes the pain and discomfort. Combine half a teaspoon of salt and one cup of warm water for a homemade gargle rinse. Do it twice daily for one week. The anti-inflammatory properties of garlic will ease symptoms. Chew two or three garlic cloves each day. You can also get the benefits of the garlic by adding it to your meals. For topical application, massage garlic oil directly on the affected area two or three times each day. ACV fights bacterial infections and balances pH levels. Simply create a solution by combining equal portions of raw apple cider vinegar and water. Then, place a cloth soaked in this solution on the affected region under your chin for a five-minute treatment. Rinse with warm water and repeat each day. You could also drink a glass of water mixed with one tablespoon of ACV and a bit of raw honey for taste. Honey has anti-inflammatory and antibacterial components to combat symptoms of swollen lymph nodes. Combine a bit of fresh lemon juice and one or two teaspoons of raw honey for a daily drink. You may also directly apply the raw honey onto the swollen lymph nodes. Rinse after 10 to 15 minutes and repeat two or three times each day. Reduce swelling with the anti-inflammatory properties of castor oil while you target the pain with its analgesic components. Castor oil boosts the immune system by promoting toxin removal. Apply castor oil on the lymph nodes for a five-minute treatment. Then, place a warm compress on the same area for five to 10 minutes. Do this at least once a day. Turmeric will reduce swelling and fight infections causing the swollen lymph nodes. Combine one tablespoon of turmeric with honey to form a paste and apply it directly to the affected area. Allow it to sit for 10 minutes before rinsing. Repeat twice each week. You may want to add turmeric powder to a glass of milk and drink it twice each day. This natural treatment has both anti-inflammatory and antimicrobial properties. It will help to purify the blood and lymph nodes, which will promote the strengthening of the lymphatic system. Drink at least one cup of echinacea tea daily for one week. Also known as goosegrass, this herb reduces swelling and promotes the proper functioning of the lymphatic system. Steep two teaspoons of cleavers in hot water for 10 minutes. Strain and drink two to three cups each day. As all lymph nodes need to be working properly for good overall health, and any swelling under jaw or chin should not be ignored. 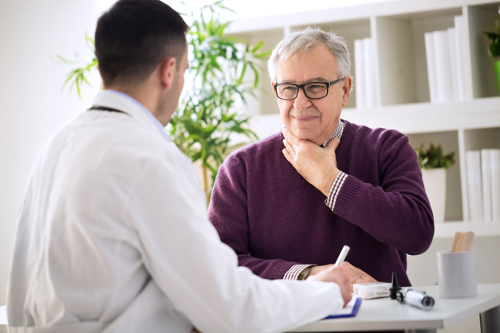 Swollen lymph nodes under chin may have a link to underlying health problems that resolve on their own or may need treatment. The swelling can also be related to the medications you are taking for other health-related issues. You can treat any cases of this condition with the use of the natural products and home remedies we discussed. “Home Remedies for Swollen Lymph Nodes,” Top 10 Home Remedies; http://www.top10homeremedies.com/home-remedies/home-remedies-for-swollen-lymph-nodes.html, last accessed June 28, 2017.